Indianapolis, Indiana – Attorney for Plaintiff, Thor Industries, Inc. of Elkhart, Indiana filed suit in the Northern District of Indiana alleging that Defendant, The RV Factory, LLC, also of Elkhart, Indiana infringed on the U.S. Patent Nos. 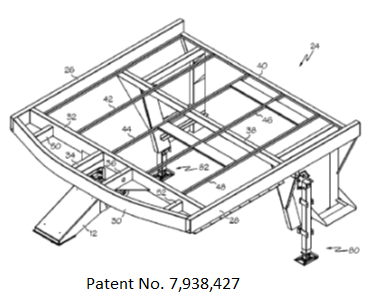 7,575,251, titled Travel Trailer Having Improved Turning Radius (the ‘251 patent), and 7,938,427, titled Recreational Vehicle Chassis (the ‘427 patent). Plaintiff is seeking judgment in favor of Thor Industries, Inc., damages, and all infringing products be recalled. 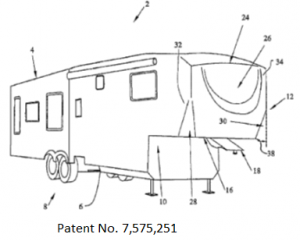 Plaintiff is the owner of the patents, which deal with the design and functionality of travel trailers. Specifically, the ‘251 patent deals with an RV chassis having certain types of angled front corners, as opposed to squared corners. The ‘427 patent covers a type of chassis with a curved or bowed front end, instead of a flat or straight front. According to the complaint, Defendant has been manufacturing and selling RVs with chasses containing the patented design elements. Plaintiff alleges that Defendant’s RV model “Luxe Luxury Fifth Wheel” infringes on the ‘251 patent. Plaintiff also alleges that Defendant’s “Luxe Elite,” “Luxe Gold,” and “Weekend Warrior” models infringe the ‘427 patent by using a curved forward surface. Plaintiff also claims that Defendant has induced and contributed to infringement by third parties who have bought and used the allegedly infringing RVs. The case has been assigned to Judge Joseph Van Bokkelen and Magistrate Judge Andrew Rodovich in the Northern District and assigned Case 2:17-cv-420-JVB-APR.